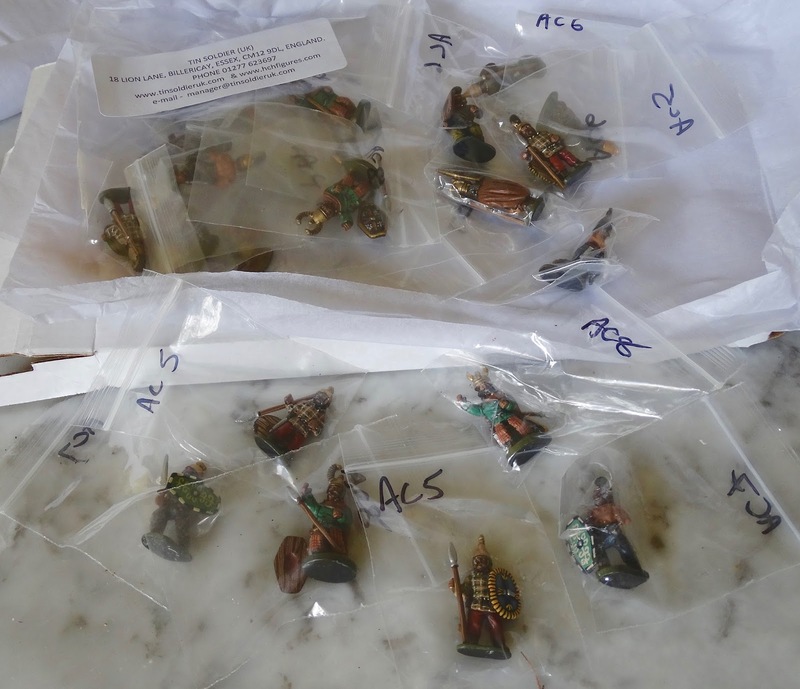 Being very pleased with my HCH Figures war elephants, I was immediately interested when HCH started doing a '30% off' sale for a selection of their painted infantry and cavalry packs. A Celtic-style warband was one of my current 'must haves' for the ancients collection, and I had been intending to purchase the Warlord Games plastic 'Celtic Warriors' set, which offered some very actively posed figures at a good price - not much more than 50p a figure. But then I noticed the HCH 'Celtic Infantry' offer (currently 30% off), and began to be tempted. 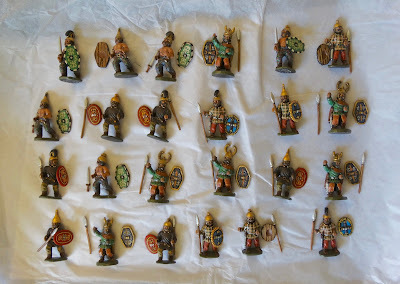 This set would cost £2.50 per figure, but that would be painted and ready to go. The standard of painting looked very good in the photos. So I took the plunge, and am very happy that I did. Ordered late morning, arrived next day by Post Office 'signed for'. Thirty-six hours from ordering, my new figures were ready to go. That's the way to collect an army! Neatly and individually packaged. No damage in transit whatsoever. Most weapons and shields come separately to aid postage. Assembly was easy. I was astounded by the quality of the painting for the price charged. Looking good in 3 ranks. The draco standard I added from the spares box. How do you hand-paint a shield to that standard? Way beyond my abilities. Plaid clothing very neatly painted. Even the backs of the shields have some detail. 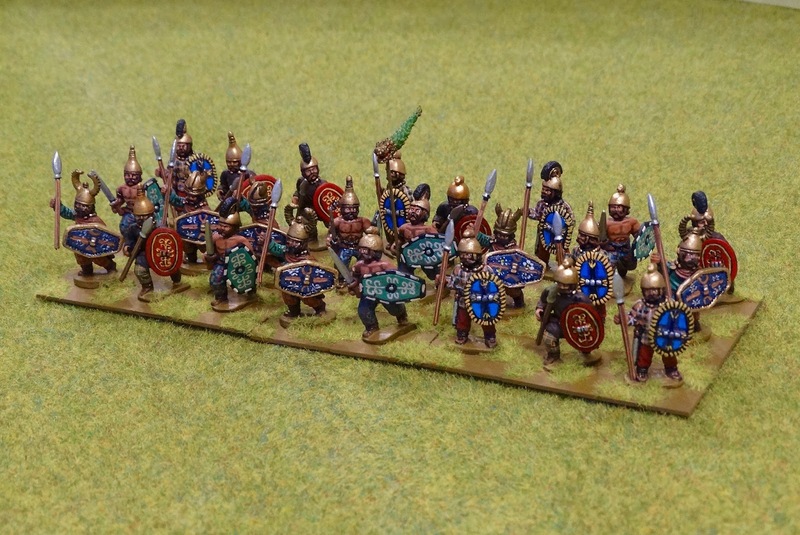 So, a 24 figure painted unit for £64 including p&p. 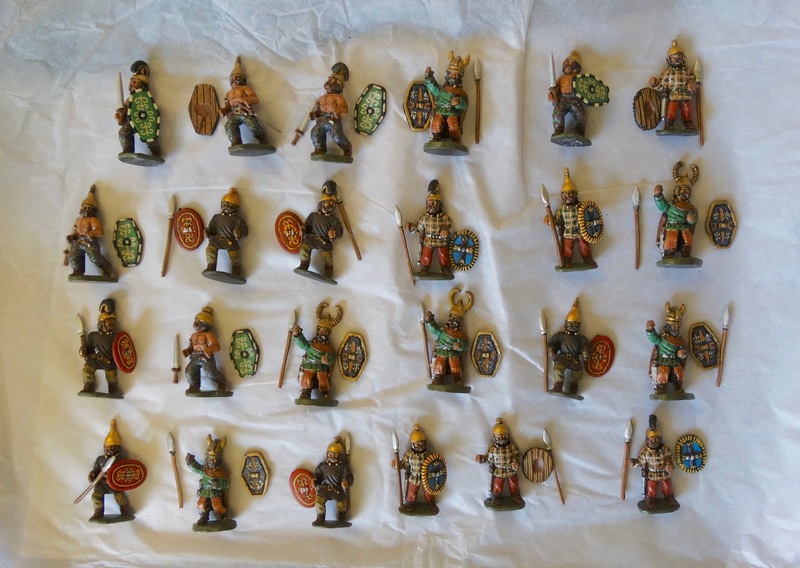 OK, with the Warlord Games plastics you get 40 figures for £22. But then it would take me a month to paint them, probably longer. With the Tin Soldier unpainted infantry figures costing around £1, you're getting excellent painted figures for an extra £1.50, which is a cracking deal IMHO. 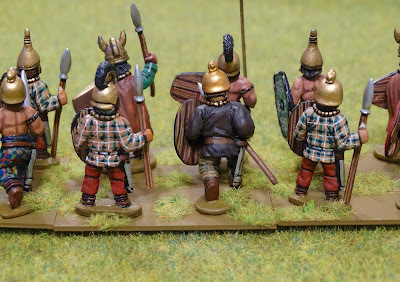 Some may feel the Tin Soldier figures lack the animation or elegance of more modern sculpts, but as with the HCH elephants I like the chunky, old-school charm of these chaps. Love the helmets, guys. There are plenty more to choose from on the HCH site, and not just ancients. Well worth a look. 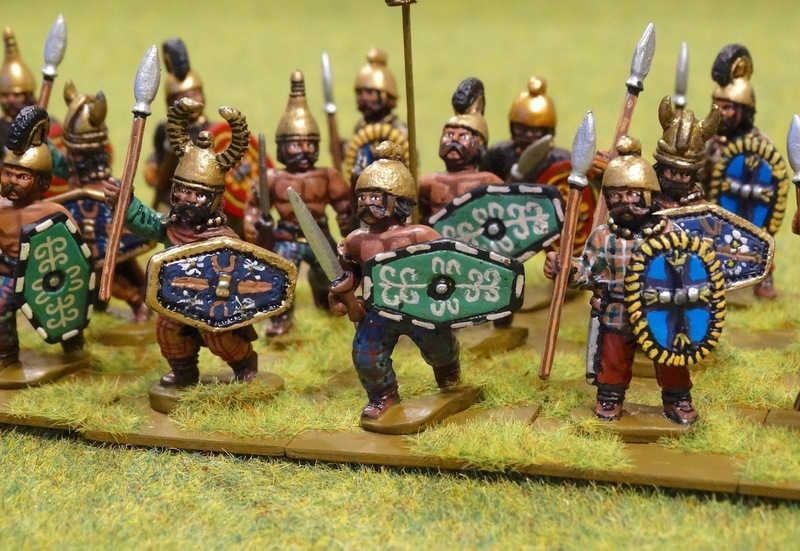 A nice addition to your ancient armies and certainly a damned good price given the level of detail on the figures. Fine painting, amazing speed, and a very reasonable price! Win win win! Can't argue with the outcome of this purchase - and well worth it not to have to paint plaid yourself!